BURNET — The folks at 221 Corder Lane in Burnet are at it again. And this time, they’re not alone. “Yeah, several of our neighbors have let us spread out into their yards as well,” said Mara Polk with a laugh. 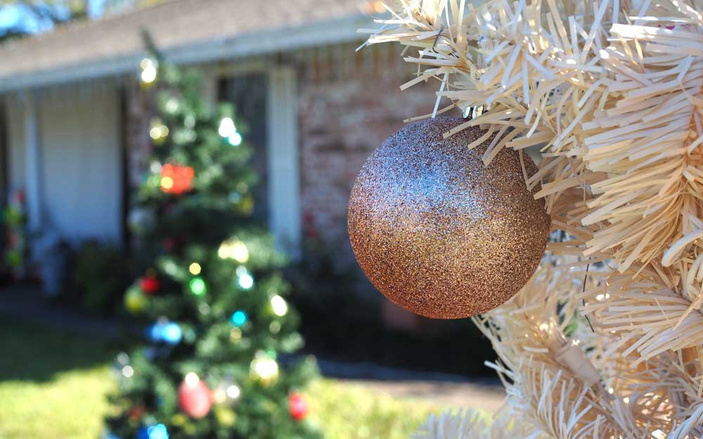 She and her mother, Glynda McBride, along with a bevy of family members are turning the Corder Lane home and several neighbors’ yards into a Christmas lights spectacular. Polk was busy setting up lights and displays right before Thanksgiving as they prepare for a Thursday, Dec. 1, kickoff at dusk. Polk’s parents, Don and Glynda McBride, created an extravagant lighting display several years ago at their Hoover’s Valley home. They also added a Halloween display. But her father decided several years ago that he was done with it — at least, in his yard. In October, Polk and her mother (again with support from family and friends) created a Halloween display in Polk’s yard at 221 Corder Lane. All they asked was visitors drop off non-perishable food items in a container at the corner of the driveway. The food went to LACare, a Burnet food pantry. They collected more than 200 pounds of food, but Polk hopes to outdo it during Christmas. While they kept the Halloween display in Polk’s yard, Christmas just can’t be contained. Several of the neighbors gave them permission — even asked them — to expand it into their adjoining yards and even one across the street. The displays are all synchronized to a list of songs. Each year, Polk and her mom add a display recognizing something significant that has happened during the year. There’s a patriotic display to honor the United States and service members, a pink one to recognize the battle against breast cancer and other cancers, and one even for Paris. “After (the terrorist attack in Paris), we added the Eiffel tower to honor them,” Polk said. Plus, there’s a multitude of lights, sculptures, reindeer, snowmen, and even a few penguins. Polk couldn’t put a number on how many lights they set up. There are lights on the roof and along the garland that lines the yards. While she enjoys Halloween with the intricate moving displays, Polk admitted the Christmas one really feels special. Along with the lights, Santa Claus is scheduled to make a stop from 5-7 p.m. Saturday, Dec. 10. Though they ask children bring one non-perishable item to donate, it’s not a requirement to visit with the Jolly Ol’ Elf. Plus, it’s a great chance for parents to get photos of their child with Santa. The display runs nightly from dusk to 9 p.m. through Dec. 31.